An ex-teacher is on trial for revealing the secrets of an alleged cult. And in what may be a precedent for free-speech rights, he won't have to reveal his identity. Very little is known about the writer Skywalker, other than that he was once an adherent of the international spiritual organization Art of Living Foundation, and is now one of its most vociferous critics. Although Art of Living, which has outlets in the Bay Area, including the East Bay, presents itself as a charitable organization that specializes in health and stress reduction, Skywalker argues that, at best, it's just an offshoot of transcendental mysticism with a veneer of being ecumenical. At worst, it's both a tax shelter and a cult, "masquerading as a humanitarian organization." On his WordPress blog, "Beyond the Art of Living," Skywalker impugns the organization with gusto. He accuses its practitioners of lying, brainwashing, and hurting the very people they purport to help. He characterizes "His Holiness Sri Sri Ravi Shankar," the Indian self-styled prophet who founded Art of Living in 1981, as a false guru. He deems its acolytes as victims of mental abuse. His tone is patient and measured, but his critique is exhaustive. And he's gotten traction: A post last week garnered nineteen comments in three days. The "About" page boasts 148 comments — and counting. Initially, Skywalker hoped his blog would steer away potential converts, but now he has become a lightning rod in what could be a precedent-setting First Amendment case. Art of Living has sued him for damages, and while a federal judge has ruled that a pared-down version of the case can go to trial, the judge also said that Skywalker could remain anonymous. "As far as I know," said First Amendment attorney Joshua Koltun, who is representing Skywalker, "that's unprecedented." When Art of Living officials first discovered Skywalker's blog, they tried everything within their power to destroy it — first by filing a subpoena for the author's personal information in an apparent attempt to out his identity, and then by suing him for alleged "trade secret" violations. Because Art of Living doesn't actually have an airtight libel case against Skywalker, its leaders have gone after him for posting what the organization claims is classified material and for allegedly hurting their business. In short, Art of Living officials found, in the laws protecting commerce, a vehicle to try to suppress free speech. 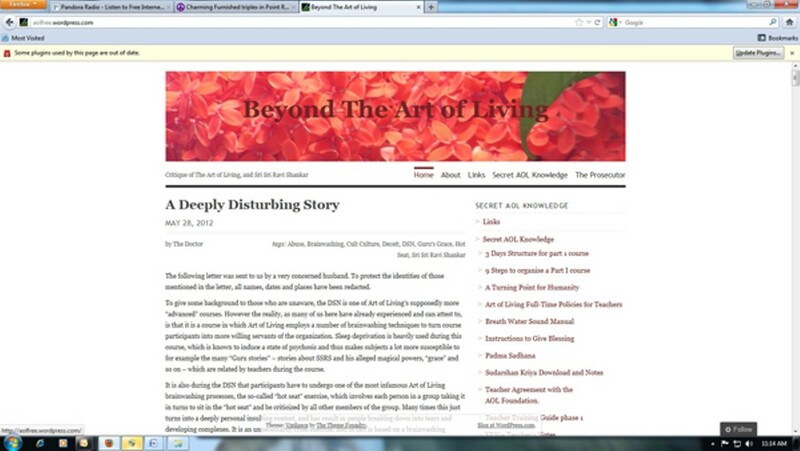 It all started in the summer of 2010, when members of Art of Living got wind of "Beyond the Art of Living," and of a similar blog called "Leaving the Art of Living," which was penned by another defector, Klim, and hosted on Google's Blogger platform. Both bloggers had been teachers at the foundation, which gave them access to privileged documents and insider information. Klim used the information merely as background, but Skywalker went ahead and revealed what the organization said were secret documents. Most of them were primers on breathing techniques that the foundation had tried to commercialize (Skywalker argued that they weren't any different from common yoga practices and/or ways to hyperventilate). Some were teaching manuals. To an outsider, they wouldn't seem all that special, yet they provided Art of Living with a legal avenue to try to stop Skywalker. The foundation issued a takedown notice via its Indian chapter, Vyakti Vikas Kendra India (VVK India). In short order, Skywalker received a letter from WordPress, saying that he had committed copyright infringement. Without a lawyer to challenge the case, he removed the offending material. But the foundation's US chapter still decided to sue Klim and Skywalker anyway, alleging that during the two months it was posted, the manuals garnered enough page views (498, according to data tabulated by WordPress) to wreak economic damage on the organization, which normally sells its techniques for a fee. Moreover, the plaintiff alleged that some of the documents Skywalker had posted contained trade secrets. The plaintiff's attorney, Karl S. Kronenberger, painted it as an instance of two rogue employees distributing proprietary information in violation of the non-disclosure agreements that all teachers sign at Art of Living. He also said that since the notes had been published, the foundation had seen a precipitous drop in enrollment, and a subsequent loss of revenue. Kronenberger also requested that Google and WordPress — which is hosted by a company called Automattic, Inc. — disclose the identity of bloggers Klim and Skywalker. It isn't that unusual for big companies to file a suit and issue a subpoena to muzzle their critics, said Matt Zimmerman, a senior staff attorney at San Francisco's Electronic Frontier Foundation and co-author of an amicus brief in the case in defense of Klim and Skywalker. "In most cases the subpoena is just granted," he said, explaining that the court has no obligation to decide whether the complaint is legitimate or not, and in most cases, the defendant doesn't have the resources to fight it. "Frequently you'll wind up in a situation where nobody objects, and Google will simply turn over the [subscriber] information," he said. Usually that amounts to a Gmail or an IP address, which the company can then wield to get further identifying information. Many cases don't even get that far — usually, the point of litigation is to expose the critic, and not proceed. In this instance, though, Skywalker and Klim sought a First Amendment attorney, Koltun, who agreed to fight their case pro bono. (Koltun also successfully defended the Express in a libel suit waged by 2010 Oakland mayoral candidate Marcie Hodge.) In November of 2010, Koltun appealed a magistrate judge's decision to serve subpoenas on Google and Automattic, taking the case straight to Judge Lucy Koh in US district court. The lawsuit had begun with eight allegations leveled against both Klim and Skywalker — one count each of defamation, trade libel, copyright infringement, and disclosing trade secrets — but in a ruling last month, Koh threw out everything except the trade secrets claim against Skywalker, which, she said, had some validity. However she had previously made one important exception: that the case could proceed without unmasking Skywalker's identity. "That doesn't mean he sits there with a paper bag over his head," Koltun said. "It means he just doesn't show." In other words, the trade secrets suit can go to trial with Koltun representing the defendant's interests, and Skywalker blogging away from some other part of the world. In a November 9 ruling, denying Art of Living's request to unmask Skywalker and Klim's identities, Koh cited the 1995 Supreme Court case McIntyre v. Ohio Elections Commission, which deemed that an Ohio statute against anonymous campaign literature was unconstitutional. Koh wrote: "Insofar as Skywalker may communicate his message more openly or garner a larger audience by employing a pseudonym, unveiling his true identity diminishes the free exchange of ideas guaranteed by the Constitution." Moreover, she wrote, revealing Skywalker's identity could have a chilling effect on other critics of Art of Living. Koh also noted an important difference between this case and previous Internet intellectual property suits, most of which had revolved around music downloading. When Sony Music sued forty unidentified defendants for illegally downloading and sharing files, the court decided that, while file-sharing might be marginally expressive (i.e., expressing the desire not to pay), it's not "seeking to communicate or convey an idea." Because Skywalker is accusing Art of Living of being a cult and a sham, and because his arguments pertain to religion and ethics, he's part of a much larger public discussion than the average music downloader. Thus, Koh concluded, the magistrate judge should have applied a more rigorous standard when choosing to grant the subpoena. "It's rare for a court to come to this point where it finds that there's a valid cause of action, and yet it keeps the identity of the defendant a secret," Zimmerman said. He also said the judge deserves "a lot of credit" for not acting arbitrarily, or rewarding Art of Living before Skywalker is actually tried. Although her ruling might make the procedure more cumbersome, Zimmerman said, it's also fair.